The Club Ponytail had both a ‘basement night club’ and the main up-stairs night club. The Basement Night Club had a very small stage, bar, dance floor and tables and chairs. It was a nice place, but it was seldom used. 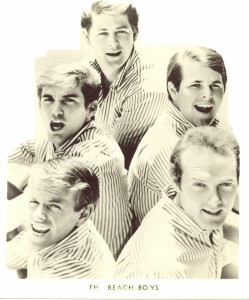 When the Beach Boys came to the Club Ponytail in the summer of 1963, they performed similar to most “bar bands:” 4 sets of 40 minutes each, taking 20 minute breaks. Of course that didn’t last too long. It became one show of around 1- 1/2 to 2 hours and then DONE, and moving on to the next engagement. 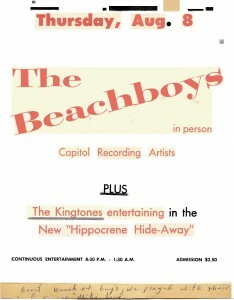 Since Stan Douglas, the owner of the Club Ponytail paid The Kingtones by the week, he didn’t want the band to get out of playing on the night the Beach Boy’s played, so he had them set up in the “Basement Night Club” to play music during the Beach Boy’s 20 minute break. Since the Kingtones were playing very current Top 40 music, the kids loved us and came running down stairs to dance to our music during the 20 minute break. During these Beach Boys breaks, when all the kids came down to the “Basement Night Club” to dance to the Kingtones, two of the Beach Boys, Mike Love and Al Jardine, came down stairs with their saxophones and joined in playing with the Kingtones for 20 minutes. The Beach Boy’s songs had no sax parts, so Love and Jardine seldom got to play their saxophones in front of a crowd. Here they found a chance to play and took advantage of it. Of course, The Kingtones felt flattered that they would jam with them. Of course, Phil used to kid that he was surprised ANYONE wanted to play with them. But seriously, they were great and my hubby and I were regulars at their gigs, wherevever they played from 1972 0n.